The Information Quality Graduate Program was founded in 2006 as a collaboration of the University of Arkansas at Little Rock, Acxiom Corporation, and the Massachusetts Institute of Technology (MIT) Chief Data Officer and Information Quality Program. For ten years, the IQ Program has been a world-leader in IQ Education. The program is the only graduate program in the United States that offers master’s and doctorate degrees in Information Quality. 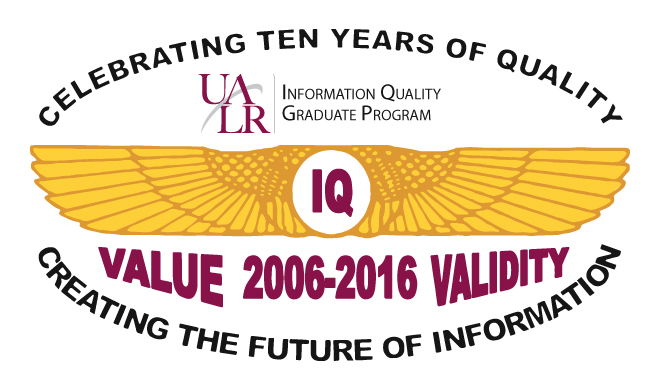 In 2016, the UALR Information Quality Graduate Program celebrated its Tenth Anniversary. At that time, we recognized our Alumni and Faculty, heard from our Founders, and gave exciting news about the future direction of the IQ Program. One of our Special Guest Speakers was Mark Ramsey, Chief Data Officer for GlaxoSmithKline. The event’s program can be viewed here.